When was the last time someone responded badly to something you’d made? In the kitchen, I tend to be my own worst critic. Although I enjoy cooking all sorts of savoury dishes, I definitely get the most joy out of baking and making desserts. And one major bonus that comes with being a baker is that your creations are almost always met with a rapturous response. While I’ll worry that something hasn’t turned out quite perfect, that the top is too brown or the middle less moist than I’d hoped, most of the time people have nothing but praise to impart when handed something sweet. Maybe it’s an inherent insecurity which means I thrive on this praise, or perhaps conversely it’s some sort of overblown ego which makes me enjoy the eager eyes, nods of appreciation, squeals of pleasure and silent smiles of satisfaction, but the reaction of my friends and family to the treats I make brings me at least as much happiness as the actual processes of both baking and eating. Of all our critics, children are often the harshest. They know what they like, they say what they think and they aren’t afraid to voice it in the clearest of terms. I don’t yet have any of my own, but can imagine that putting supper on the table for your kids day in and day out can sometimes be a thankless task. I’ve said before that my Mum was (and is still) a wonderful cook, but I remember how all too often my brother and I would wrinkle our noses at dishes she’d made that we didn’t like, criticize her cooking, lament the fact that we weren’t allowed Alphabites for tea and other such holy grails of childhood cuisine. Last weekend we went over to a friend’s house for lunch. A gluten free (coeliac rather than just fussy) friend to be precise. I’d offered to bring dessert and, after making this heart-stopping two-tiered chocolate creation the last time we saw each other, I decided to try my hand at something a little lighter and brighter. I sent out a request for help on Twitter, and dozens of tweets later (there’s a lot of love out there for gluten free cake) decided polenta should be my main ingredient. Mixing and matching ideas from various different recommended recipes, I ended up with this orange, pistachio and polenta cake. Dense and moist with a fragile golden crumb, this cake is lent a sublime stickiness by the sweet citrus and honey syrup, while a thin layer of tart yoghurt and orange icing studded with crunchy pistachios elevates it into an elegant and grown up dessert. Everyone seemed to enjoy it, there were noises of appreciation and everyone at the table went back for second slices (always a good sign). Then my friend took a couple of crumbs and popped them into the mouth of her eighteen month old daughter. Who promptly burst into tears. And I mean tears. Not just a slight welling up around the eyes, but big, angry, streaming blobs, blotchy cheeks and howls of anguish. This was not a happy child, and in comparison to the cute little kissing noises she made when presented with my previous chocolate creation, her reaction wasn’t entirely the seal of approval I’d been hoping for. After our laughter subsided (please don’t think we’re harsh for laughing at a small child, but she timed her tears with such comic accuracy), excuses were made, teething and tiredness blamed, and we happily finished the final few crumbs on our plates. And while I’m not going to take those tears to heart, I do think they may have been something to do with the slightly unusual texture of this cake, which is something worth pointing out in this post. If you’re expecting a feather light classic Victoria sponge, think again. The combination of grainy golden polenta and dense, nutty almond makes for a rich, sticky, slightly crumbly cake which packs a hefty citrus punch. This isn’t a cake you could slice in half and stuff with buttercream, it’s solid and substantial, made for soaking up spoonfuls of sweet syrupy gloop and perfect eaten alone or with a scant spread of tart citrus icing. A dessert for grown ups. One of the things I like about this recipe is that it’s naturally gluten free. Rather than trying to emulate anything made with normal flour, it takes on an identity of its own. It’s also infinitely adaptable – you could add crushed nuts to the batter, exchange the citrus for elderflower or apricot cordial, crush some cardamom or other spices into the batter or stir through chocolate chips. If you decide to make this cake, or any variation of it, I’d love to hear what you think. Unless it makes you burst into tears, that is. Grease and line a 20cm round spring form cake tin. Preheat the oven to 180 degrees C.
Cream together the butter and sugar until light and fluffy. Stir in the ground almonds. Beat the eggs and yoghurt together then stir in lightly with a fork. Mix the polenta and baking powder then fold into the mixture with the orange zest and juice. Spoon the mixture into your prepared tin and bake for 30 minutes. Turn the oven down to 160 degrees C then bake for an additional 25 – 30 minutes, or until a skewer comes out clean and the cake is firm. Bring the orange juice and honey to the boil in a small saucepan. Reduce heat and simmer for about five minutes until thickened. Use a skewer to spike holes in the top of the cake then spoon the syrup over. Leave in the tin to cool completely. Mix together the yoghurt, icing sugar and orange juice and spread over the cake, allowing to trickle down the sides. Sprinkle over the chopped pistachios and pop in the fridge to set. Serve at room temperature. I love the sandiness of polenta cakes – it works so well with citrus flavours and this is a lovely combination of flavours. My young cousins almost always turn their noses up at anything I’ve baked, I’ve started to take it as a compliment now! That must have been quite a moment when the little one started crying! This is gorgeous! What a colour! 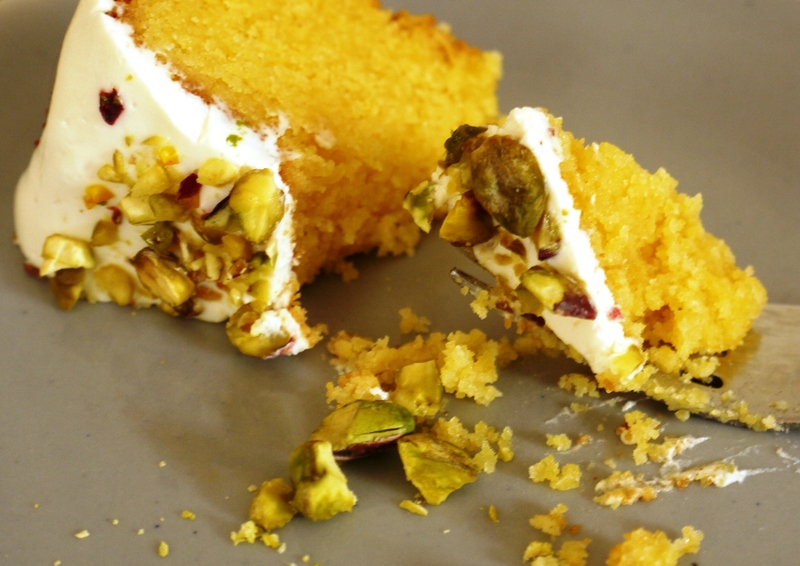 I adore polenta cakes, and what a lovely combination with the orange, honey, yogurt and pistachio. Hhehe what a funny reaction and it’s definitely not the one you would want (and I’m sure could be blamed on other factors too!). Seriously, I could have written this post. I worry always… I am my own worst critic. Until the sons arrive, then it is harsh judgement indeed! So harsh they will refuse to eat any of it (chocolate cake!!!) because it isn’t the one I made last time or it is a tad dryer than usual or denser and moister than usual… and I am left having to eat it all alone. Ugh. But no one has ever burst into tears 🙂 This is an incredible cake and bookmarked now. Gorgeous!! This looks amazing! I love the taste and density of polenta/corn meal in cakes – a bit like cakes made with ground almonds, its completely different to a cake made with flour but very good in its own way! Regula – it’s not kind to laugh at anyone crying, but it was really very funny! Choc Chip Uru – thank you. Susan – I’d not eaten that many polenta cakes before but I’d definitely make one again. Jamie – I think when you love baking it’s hard not to be a perfectionist. But sometimes you have to let go – things almost always turn out delicious! My Kitchen Stories – good point, all the more for me! Kerry – thank you. And yes, polenta does give a cake a very different texture but it’s delicious in its own way. This sounds like my sort of cake… Ive developed a real thing for ‘grown up’ tasting cakes. The combination of polenta and almond sounds heavenly! I can sort of see this might not be the sort of cake a baby would enjoy, but bursting into tears sounds a bit extreme! This sounds delicious and is such a gorgeous colour. As you know I’ve made a chocolate polenta cake on many an occasion and everyone seems to love it. I’ve also made a rhubarb polenta cake which is good too, but I love the additions of yogurt and syrup you’ve given to yours – it makes it something else entirely. I love cornmeal or this more textured polenta in baking. This sounds delicious, and since my daughter is in that “I don’t like cake” phase (alongside the “I don’t like vegetables, tomato sauce etc. etc. etc.”) anyway, and my son copies everything she does and says, I am not going to worry about whether the kids like it one little bit! This looks delicious and decadent. Lovely pairing with the pistachio! And of course I loved reading this post because I am almost the EXACT same way! I bake more than I cook, because I feel like it’s “safer” and always, always pleases (why I bake/cook in the first place, like you). I do think having a boyfriend who isn’t a sweets person has made me appreciate the fact of pleasing through cooking though… oh well one has to hope I’ll get into it, haha. Ditto all the above comments regarding like minds, lovely blog etc etc! I hav baked many a polenta cake, always using the standard river cafe recipe, perhaps adapting it with blood oranges, or adding a few ground cardamon pods in lieu of the vanilla, and each time it has been lovely, though an endless quest for perfection ie should it be more moist, should i cook it a little less etc! I still eat it though! Re the jamie recipe, please have a go in its entirety, perhaps un-iced, for it is divine with the pistachio and elderflower. Just make sure you dont leave the nuts too coarsely ground for the leave the cake a little too dry and crumbly! 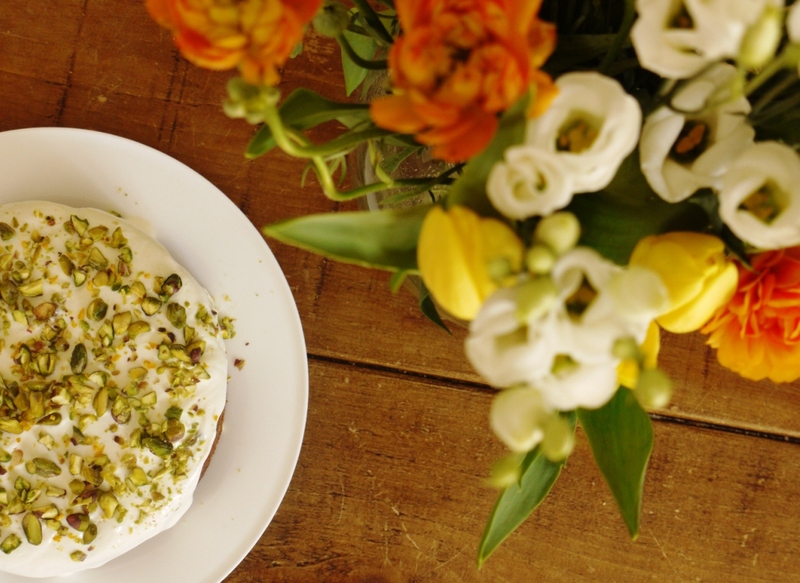 My Dear Bakes – thank you, it is a very spring-like cake! Choclette – I love the idea of both rhubarb and chocolate polenta cakes, yum! Becs – agreed, colleagues are the most appreciative taste testers ever! Nuts About Food – well if you make it, enjoy! Urvashi – thank you, the pistachios do add a really lovely crunch on top. Frugal Feeding – thank you. I love polenta cakes, the texture is so great, dense and crumbly!! Oh man, that poor kid! I promise that I wouldn’t burst into tears if I tasted this cake, though. Pistachio and orange–perfect. I don’t think there’s anything you make that I don’t love. I’m drooling over this cake, the spiced orange mousse cake, and the dark chocolate tart with salted caramel ice cream below. 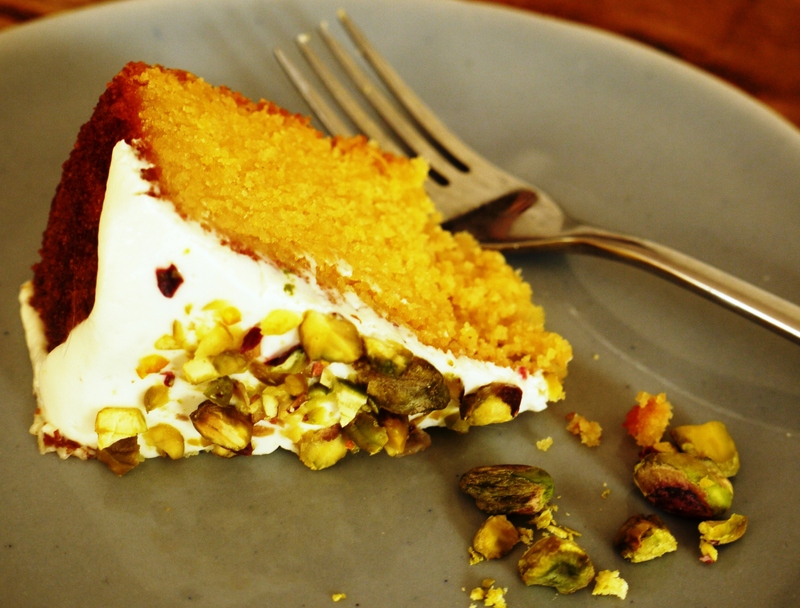 I make an orange cake similar to this, with pistachios, but never tried it with polenta. This is definitely SAVED! I often keep my own critics to myself. Oh my cake is too sweet, too dry. But somehow, my sis’ friends always managed to say the same critics about my baked goods. It has its sides of “hurt”. I have no idea how my sis puts it out to them that they are willing to lay the critics out on the ground. Anyway, I’ve been dying to try out the world of polenta! Dense, thick, moist. Would be perfect for a pudding’y type of cake too. I love polenta cake and this sounds wonderful combination of flavours. What a cute story. A child’s palate is a curious thing. And when it comes to cooking and baking, I am very critical of myself! Absurdly critical, actually. I love polenta-based cakes but I’ve never made one myself. This reminds me a little bit of a Golden Lemon Almond bundt I make. It’s not gluten-free (half flour, half ground almonds), but it is similarly dense and saturated with a lemon-almond soaking syrup. I love the use of honey in this beautiful cake! that cake looks amazing and the flavours are just everything I love! Gotta bookmark this recipe and give this a try! Love that it’s gluten free as well! I think I would cry if you gave me a slice of that! It looks fabulous. Pistachios are one of my favourite things. Oh the baby probably didn’t like the orange flavor or the texture. Kids are so funny with their likes and dislikes and they seem to change them so quickly! Your cake sounds lovely! I love the texture that polenta gives cakes, this sounds amazing. Eileen – haha thank you! Pencil Kitchen – you should definitely try it. Laura – it’s definitely the graininess they don’t like – I didn’t either when I was little! The Single Gourmet & Traveller – citrus + polenta = delicious. Lianne – do give it a go! Euan – as long as they’re tears of joy I don’t mind. Delicio8 – my friend said it might actually have been the citrus because the baby was teething, but I’m pretty sure it was the grainy polenta! I love all of your recipes, but this is calling to me! If I were to make this a loaf, what should I change? We must have been working on our polenta cakes around the same time for coeliac friends – what a coincidence! I had never made one before but now I am converted so it is great to see another flavour option as it is certaionly a make again cake in my books. I can understand the inner critic I am terrible for telling myself off! Benjamin – ah, thank you, so glad you liked it! I fell in love with polenta cake when on a trip to Brighton. 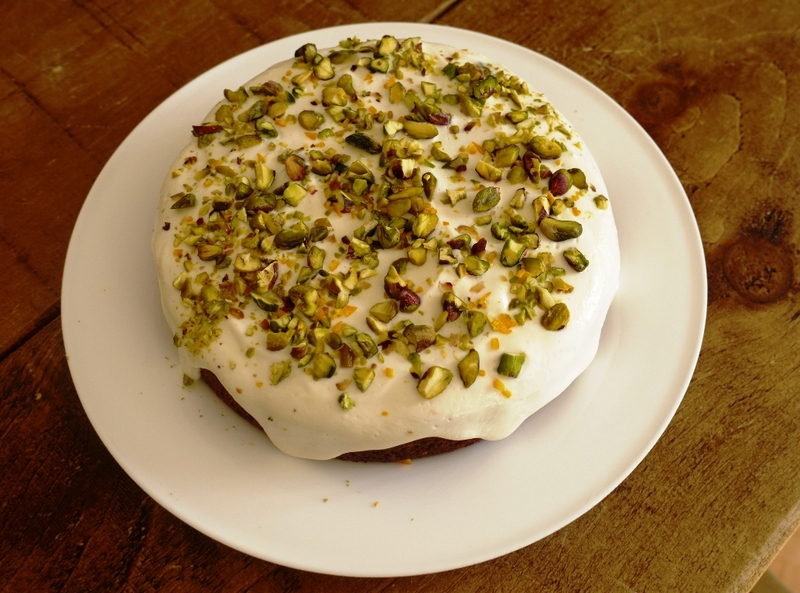 I have been wanting to try out a polenta cake recipe for ages…I stumbled across your recipe and fell in love with it (mainly the topping of yoghurt and pistachios looked scrummy!). I made it this afternoon and it worked like a charm!!! My entire family have scoffed the lot 🙂 Fab recipe thank you! This looks unbelievable! I have no interest in a sparse, deprived January, so I think I’ll be attempting this fairly shortly. Long live the cake that children don’t grab for – more for you! I plan to make this on Sunday for friends – need a little spring cheer in these wintry conditions. Tears will be met with a stern glance and threats of making them eat in the snow. Haha, hopefully it’s only small children who burst into tears 🙂 Enjoy the cake and do let me know how you get on! I never leave comments on blogs – but wanted to thank you for this recipe. Have been playing around with polenta cake recipes for ages but not found one that was quite hitting the spot for me – til google brought me here. Greek Yoghurt! Of course! Eureka moment in my kitchen. So thank you! Hey Kate – long-time lurker, first time commenter! Your site is delicious – I’m on a permanent diet (high protein, similar to Carnivorous Husband but minus the obscene amount of eggs – allergy 🙁 ), but frequently procrastinate at work by browsing your amazingly creative recipes. I’m going to be moving back down to London next month and was hoping to bake a load of stuff as goodbye gifts to friends, especially my colleagues who are all cake lovers. It also serves the dual purpose of using up the crap that’s been lurking in my cupboards all year – sneaky 😉 I think I have some polenta that’s just dying to be transformed into this cake! I was just wondering if you think this would work as muffins? Transporting leftover individual little cakes is always so much easier than a half-eaten cake. Yum yum. Such a delicious recipe. Thanks for sharing this.